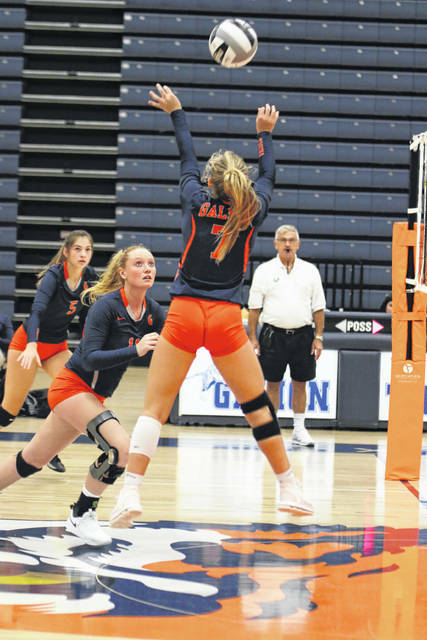 GALION — After falling on the road to Mid-Ohio Athletic Conference foe Pleasant on Tuesday, the Galion Tigers beat River Valley 25-15, 25-22, 25-18 Thursday. The win moves the blue and orange to 11-3 overall on the season and 8-1 in the MOAC. The home team’s defense played a crucial role in the win as they tallied 13 blocks and 46 digs. At the net, Samantha Comer shut down five River Valley kill attempts while Brooklyn Cosey posted four blocks. Jaden Ivy, Gillian Miller and Gracie Groves all turned in three blocks at the net to thwart any potential Vikings’ run. Ivy would record 14 digs to lead the way for the defense. The Lady Tigers were 49/52 in serve reception. Offensively, Galion would be nearly flawless handling the ball, going 99/100 en route to 33assists. At the net, the Tigers notched 34 kills. Hardy finished 86/86 handling for 31 assists as the primary ball handler. Comer and Foust tallied one assist apiece for the home team in the win. Kill stats for the Galion squad were: Comer- 11; Ivy- 9; Miller- 7; Cosey- 4; Groves- 2 and Hardy- 1. The serving game was effective for the Lady Tigers as they posted seven aces on 68/76 serving. Schieber and Foust would post perfect serving percentages on the night, going 12/12 and 13/13, respectively, notching one ace apiece. A non-conference match awaits Galion on Monday, Sept. 24 when they travel to Upper Sandusky for a clash with the Lady Rams. On Tuesday, the Tigers will head to Marion for a clash with the hosting Harding Prexies. Galion will be back on their home floor on Thursday, Sept. 27 where they will play host to the Clear Fork Lady Colts. MARION — On Tuesday evening, Pleasant avenged an Aug. 23 loss at Galion by beating the Lady Tigers in four sets, 22-25, 25-18, 23-25, 25-27. That loss forged a three-way tie atop the MOAC as Pleasant, Ontario and Galion each have just one league loss. Thomas turned in a stellar, 20/20 performance, leading to three of those aces. Ivy had quite an evening at the line as well, finishing at a 14/18 clip while posting five aces. Galion’s attack was led by the usual killers as Ivy turned in 17 and Comer 14. Miller would also finish in double-figures at 11. Hardy turned in four kills and Gracie Groves rounded out the 48-kill effort with two kills. Defensively for the Tigers, Cosey would lead the block party with two blocks while teammates Comer and Hardy each earned a block apiece. Galion would post 66 digs on the evening on 85 attempts, led by 15 from Foust. Thomas and Ivy would both reach double-digits, posting 14 and 12 digs, respectively. Hardy and Schieber turned in eight digs apiece while Comer finished with six. Miller ended the match with two digs and Cosey wrapped the category with a dig.